Super Rent has a selection of seven refrigerated truck hire options. Choose from a range of 2 ton to 16 ton trucks. Use these vehicles to fulfil all your transportation or refrigerated goods needs. We have 7 different refrigerated truck sizes to choose from. The 2 ton truck has a payload of 1601kg and requires a Code 10 driver’s license. Contact us. Super Rent have a large fleet of refrigerated trucks for hire, including 4 ton trucks. These vehicles will fulfil the needs of cold chain/food supply. 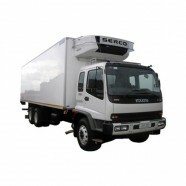 We offer 6 ton refrigerated trucks for hire. These vehicles have a payload of 4200kg. We take care of the maintenance of the vehicle so you don’t need to. Our 8 ton refrigerated trucks have a payload of 6600kg. The trucks has a -25 degree minimum temperature. Contact us for more information. We have 12 ton refrigerated trucks available for hire. These vehicle have a payload of 11400kg. Hire one anywhere in South Africa. Contact us. Hire a truck from our refrigerated truck fleet. Our 14 ton trucks have a 12840kg payload. We offer years of experience in the transportation industry. We have 16 ton refrigerated trucks available for hire. Use these vehicles to transport all your refrigerated products. Get a quote today.